The benefits of fitting a Braided hose line to any vehicle are simple and universally understood. With this new Fiesta Mk7 kit your pedal will feel stiffer and the brakes ,even with standard pads will respond better to minor and heavy pedal presures. AS far as the brakes go this DIY kit is high on the list of must haves for the Fiesta Driver. The Pumaspeed Workshop team are ready to fit the Fiesta Mk7 Stainless Steel Braided Hose Kit in our Head Office located here. We estimate the labour time to be approximately 2.33 hour(s) costing £181.74 inc VAT. Therefore making parts and labour a total cost £253.74 (inc. VAT). 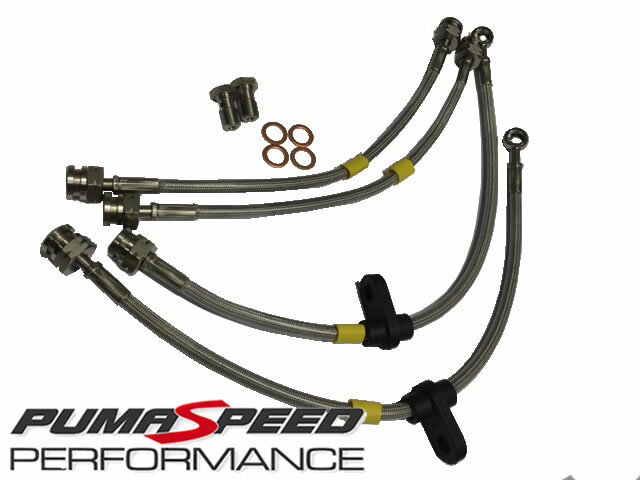 Pumaspeed have a specialist distribution team that can dispatch the Fiesta Mk7 Stainless Steel Braided Hose Kit to any destination worldwide.